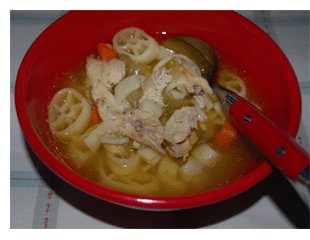 This Chicken Soup is a delightful change from the standard taste of standard Chicken Noodle Soup. Seasoned with Old Bay Seasoning, the soup makes a great weekend main course or appetizer. Cooking time from start to finish is about 2 1/2 to 3 hours. We used 1 1/2 tbsp of Old Bay Seasoning. Some folks like more Old Bay Seasoning in their cooking so you could either add more Old Bay while cooking, or serve Old Bay in a shaker at the table for your guests to add more on their own. Remove the pouch of livers and other parts from the chickens cavity and then wash well. Place chicken in a large stock pot. Wash your hands well and then add the chicken broth, carrots, onion, Bay Leaves and sprinkle with Old Bay Seasoning. Fill with water to cover chicken (2 – 3 quarts). Cover, place on stove, bring to a boil over high heat. Reduce heat, and simmer the chicken until it is well cooked and ready to fall off the bones, about 2 hours. Remove the pot from the heat. Carefully remove the chicken from the pot to a large plate. We do this with two people. One holds the plate close to the pot level with the top of the pot. The other person uses a large heavy fork inside the cavity, and a large heavy spoon supporting the body of the bird to remove the chicken from the pot. Be careful not to let the bird splash back into the hot broth. Let the chicken cool to a temperature you can work with. Then remove the bones and rip up the chicken meat into small and larger mouth sized pieces (don’t make them so small that the look like the pitiful pieces of chicken meat in canned chicken soup). Remove the Bay Leaves from the broth, and return the chicken meat back to the pot. Bring the soup back to a boil. Taste the broth and add more Old Bay Seasoning to your taste. Remember you can always add more at the table but it can’t be taken out. Add the Tabasco. Add about 1/2 pound of your favorite pasta and cook in the broth according to the package directions. Serve in a large bowl as a meal, or in a small cereal bowl as a side entree. Makes about 1 gallon of delicious Chicken Soup. Go crazy. Add corn, pimento, etc. Just don’t forget the Old Bay.